ICAR-Central Institute of Brackishwater Aquaculture (ICAR-CIBA), Chennai signed a MOU with the Coastra Biosolutions Pvt Ltd., 175, Ground Floor, Parvathipuram, Part-I, Vadaperumbakkam, Chennai-600 060 and Nambikkai Fish Farmers Group at Nambikkai Nagar, Pattinapakkam, Chennai-600 028, for production and marketing of Plankton booster, PlanktonPlus and manure for horticulture, HortiPlus from fish waste on 5th April, 2019. 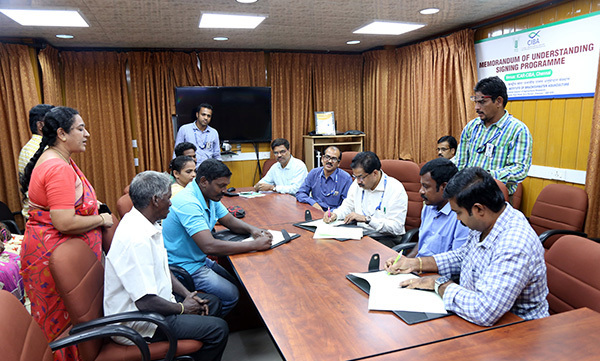 Under the agreement, the ICAR-CIBA will provide the necessary training to the Nambikkai Fish Farmers Group on production technology of PlanktonPlus and HortiPlus from fish waste. Nambikkai Fish Farmers Group, Nambikkai Nagar, Chennai will be producing PlanktonPlus and HortiPlus using Fish Waste Processing Unit established by ICAR-CIBA at Nambikkai Nagar for conversion of Fish waste to PlanktonPlus and Horti Plus. As per the agreement Coastra Biosolutions Pvt Ltd., will be marketing the products produced by the Nambikkai Fish Farmers Group under intimation to ICAR-CIBA. Dr K K Vijayan, Director, ICAR-CIBA, who executed the MOU for ICAR-CIBA, highlighted the importance of this initiative. He expressed his hopefulness that this model will be a successful and sustainable model for converting the fish waste to value added products, which can provide ancillary income to the fisher folk and will also help for making the fish market of the country clean. Dr. Debasis De, Principal Scientist and team leader for the PlanktonPlus and Horti Plus development program of CIBA briefed about the significance of this MoU and highlighted that this initiative is not only help to clean and dispose the waste from fish market which is abundantly available in the village cluster but also will help to produce quality products i.e., wealth from waste as a concept of circular economy. Dr. P. Mahalakshmi, Principal Scientist expressed that this user-friendly technology will help in improving livelihood of fisher-folk. Shri.T. Kennit Raj, representative of Nambikkai Fish Farmers Group has praised the efforts of ICAR-CIBA, in promoting of waste to wealth concept as an alternative livelihood activity for the fishers in their village.